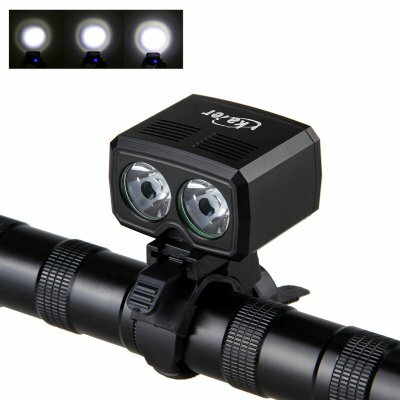 Successfully Added LED Bike Light - 800 Lumen, 2 LEDs, 5 Light Modes, Power Indicator, Charge Indicator, IP65, 1200mAh Battery to your Shopping Cart. Stay Safe and be seen on the roads with this powerful 800 lumens LED bike light. With two bright white LEDs and a 1200mAh battery, you can make yourself seen on those early morning or evening commutes when the sun isn't up to light your way. Made from a tough aluminum alloy this durable bike light it small and compact, it comes with two easy to adjust handlebar mounts. The cleaver brackets have an easy to use tightening screw that lets you adjust its position without the need for any tools and the quick release clip. So you can swap this bike lamp between your commuting bike and weekend racer in a matter of seconds. This LED bike light has 5 lighting modes that you can switch between at the touch of a button. With low medium or high beam light as well as strobe and SOS functions this LED lamp is suitable for attracting attention and produces plenty of light when riding in dark or rural areas without street lamps. With a power indicator, this bike light will let you know how much charge is remaining by showing a green, blue or red light to indicate 80,60 or 20% charge remaining so you always know when the battery needs recharging won't be stuck without a light to guide you. The small size and light weight of this bike light mean it's easy to slip into your pocket once you park up. Quickly recharged through a micro USB port means you can top up the power between rides. This LED bike light comes with 12 months warranty, brought to you by the leader in electronic devices as well as flashlights, bike lamps and cool gadgets.